A Day on the Pond, By John Greer | Web Shui, L.L.C. The event began a couple days earlier with a group of about six people deciding on a plan to support those in Seattle, active in protesting Shell’s effort to drill in the Arctic. A second meeting was arranged at the launch site for Plan C, where we expanded our group of like-minded people, sharing concerns for our planet and each others well-being. We were informed that we’d need to remain on high-alert, awaiting notification that Shell’s flotilla had pulled anchor to begin its long, slow journey into the Arctic, for the purpose of plundering oil deposits in one of the most environmentally sensitive, hostile and prohibitive places on earth. 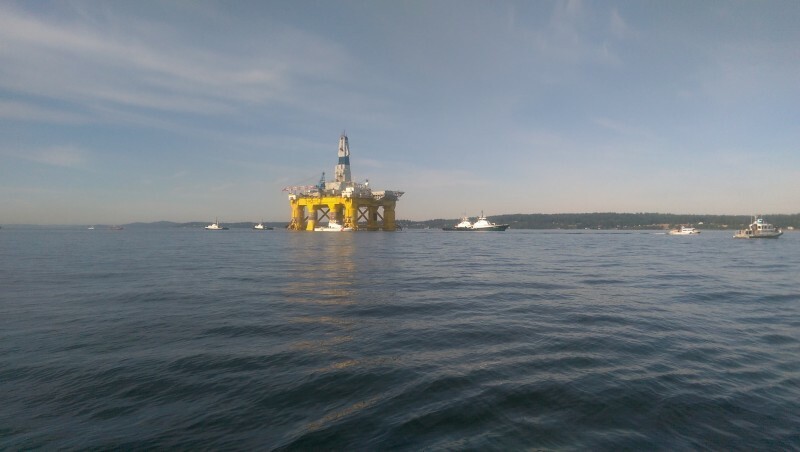 The day began when I got a text message around 5am, indicating that Shell’s flotilla, the Polar Pioneer was being un-docked and preparing its northward journey through Puget Sound to the Arctic, and that Plan A was being implemented. It was understood that there would be a human blockade in place at the point of departure, which might stop, or at best, delay their timely departure.In any case, we knew that any delays they might create would expand our window of opportunity, as was the case. As expected, ‪Greenpeace‬ members were able to form a human-kayak blockade, and those courageous enough to participate were soon arrested, processed, issued a $250 to $500, citation and later released. Even with these heroic efforts, the flotilla was well under way shortly thereafter, being towed by two tug boats, and followed by two more. In addition, a fleet of coast guard and police vessels were escorting the flotilla on it’s journey. Our group, a hastily organized group of concerned citizens, students and several parents of students based on Bainbridge Island and Bellingham, formed a coalition known as “Plan C”. It was our understanding that Plan A was the initial human blockade adjacent to where the flotilla was initially docked. Plan B, was intended to to be a second group of kayak enabled activists, known as kayactivists, were to launch from another location, to form a second blockade, by leap-frogging from the Plan A position to another nearby strategic position, or choke point. Plan C was initiated as another means to organize a group of kayactivists, not only to launch from Bainbridge Island’s Fay Bainbridge Park, but at additional sites along the route, including Kingston, Hansville, Port Ludlow and Port Townsend. It was our intention to mobilize and initialize multiple efforts, in an effort to delay and ultimately prevent the flotilla from leaving Puget Sound. Following the initial alert, we rallied and got a group of kayactivist to Fay Bainbridge and by first light, we had seven kayactivists and a 22′ Searay ski boat. As captain of the ski boat, I took it upon myself to ensure the safety and support of each and everyone in our group, and get them out and into the shipping lanes, far from any shoreline. Throughout the day, we provided fresh water, food, a rest room and first aid, if needed. By about 6am that morning, we were on the water and fully mobilized. We heard that Plan A was able to delay the flotilla, and while Plan B turned out to be nonexistent, we were the only remaining protesters left to face this monster, like David facing Goliath. As the flotilla and the armada made its way toward us, we formed a wide line in it’s path. Keep in mind, there were only seven kayaks and one ski boat, with a monumental task. Courageously, we stood our ground and were quickly intercepted by Coast Guard vessels and police vessels. We understood the Coast Guards were there to ensure the safety of all concerned, but the police were far more malevolent. They abruptly and forcefully targeted and arrested Chiara D’Angelo, without giving her any opportunity to evade arrest, as they rapidly approached her kayak with a wake strong enough to flip her over, and grabbed her oar, thereby preventing her from making any sort of evasive attempt to move away from the ambiguous 500 yard zone that we were told not to cross. From my ski boat, I tried to ascertain where they believed the 500 yard perimeter was, but no one gave any indication, other than to push back away far enough, as to allow the police vessels and coast guard vessels to stand between us and the flotilla. Following the arrest of Chiara and the delay created by our confrontation, and with the help of a steady wind, the flotilla drifted further in a westward direction toward Fay Bainbridge and came to a dead stop. We noticed the two tug boats were scrambling from a forward to a side facing position, and we watched the flotilla pivot and turn slightly, from its initial position, but without making further forward progress. Those of us on the ski boat and in kayaks were elated that our efforts seemingly resulted in successfully stopping the flotilla’s forward progress, and while this may or may not have been the flotilla’s intention, the fact is they were completely halted and immobile. Minutes later, after having come to a dead stop, just offshore of Bainbridge Island’s west facing coastline, we observed two more tug boats speeding quickly toward the scene which strongly suggested that there was some kind of problem with the Flotilla, and extra muscle was needed to remedy the flotilla being grounded, damaged, or worse. While monitoring radio broadcasts on our ship-to-shore radio, we knew that the two larger tugs were being used in place of the smaller tugs, and within the next hour or so, they would resume their journey. While awaiting their departure, we were met by three more kayactivists, one of whom was extremely seasick and with a broken oar. We provided assistance, of course, and learned that their party had kayaked all the way from Edmonds to our current location, just south of Jefferson Point and Indianola. Some time later, the flotilla began moving and came to another stop, this time a bit further, maybe 100 feet or so, further off shore. From our vantage point, they seem to have had come dangerously close to the shore and had to be moved to avoid a potential catastrophe. Another hour or so passed and around that time I noticed a double sun halo, with two fully illuminated 360 degree rainbows surrounding the sun. Perhaps it’s just me, but I only see this occurrence on very auspicious occasions. Perhaps we were being given a sign by nature that things happen for a reason, and without any other apparent alternatives we had to back away, or subject ourselves to a needless arrest, without doing anything more to accomplish our mission. The flotilla was again moving toward us, being pulled by the two larger tug boats. We knew from the looks of the accompanying armada that they were resuming their journey. As expected, we had no chance of stopping the flotilla’s and even though the police vessels were no longer at the scene, the Coast Guard vessels pushed us out of the way, opening up a wide enough path for the flotilla to pass through. At around three-thirty in the afternoon, we retrieved all of our tired kayactivists, who for the most part had been actively paddling around Puget Sound since dawn that morning. We towed several of the kayaks back to Fay Bainbridge, where we were met by a few cheering supporters and others enjoying a lovely day on the beach. Everyone in our group had been safely accounted for. Whether or not we had any impact on the flotilla’s apparently inadvertent delay and rescue was uncertain, at that time. Coast Guards indicated that the rig stopped to re-calibrate it’s compass (moral compass perhaps) and Shell claims they stopped as planned, in order to reset lines to the more seaworthy tug boats, but no one admitted that a tiny group of kayakers were able to thwart the progress of a giant flotilla and cause it to run aground. This was, in fact, the case and the day’s events did unfold in the above-stated manner. In hindsight, I hope our efforts show others how a small group of single-minded activists can accomplish something miraculous, with God’s help. I also wish there had been more of us on the water to help support everyone’s courageous and heroic efforts. I was surprised how few of us actually expressed ourselves in a non-violent passive resistant manner that day. If more of us had been participating, our tactics might have been vastly enhanced. If we had any impact at all, we bore witness and demonstrated to the world that we care for our planet, all sea-life, and each other. It was a beautiful day on the water, and we were blessed by nature with favorable tides, winds and a double rainbow-sun-halo, for our heartfelt efforts.